Varicose veins affect more than 30 million Americans. We specialize in treatments to remove painful, bulging veins-- leaving you looking and feeling your best. Varicose veins can cause legs to feel heavy, painful and restless. Treating vein disease can make your active moments more enjoyable and your quiet moments, more relaxing and rewarding. Varicose veins cause needless leg pain. Our treatments are non-invasive and covered by most medical insurance plans. Set up a consultation and we can get you back to doing what you love. Are you one of the 50 million Americans suffering from varicose or spider veins? If so, the modern treatments provided by the Virginia Vein Institute can help you restore the appearance of your legs and ensure superior vascular health for years to come. Through radiofrequency ablation and sclerotherapy, you can get rid of unhealthy and unsightly veins with little to no pain, no incisions, minimal scarring, no anesthesia, and no medications. And since our varicose vein treatments are FDA approved, they’re almost always covered by every major insurance provider, even Medicare and Medicaid. Procedures typically take less than an hour in our private office, and you can be back on your feet the minute treatment is finished. That means no downtime for you and an almost non-existent risk of clotting. The same can’t be said for a visit to a standard vascular surgeon in a hospital setting. 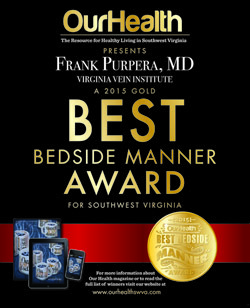 Dr. Frank Purpera, head of the Virginia Vein Institute, is a dedicated vein physician and vascular surgeon with a passion for treating venous disorders. To provide the most superior care possible, Dr. Purpera and the Virginia Vein Institute staff focus solely on venous disorders and no other vascular conditions, meaning you’ll receive treatment that’s specialized, individualized, and concentrated on your unique needs. Learn more about how the Virginia Vein Institute can help you by calling (540) 552-8346 or getting in touch online. 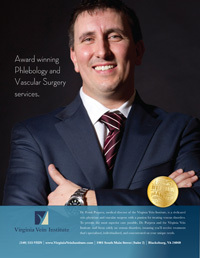 Dr Purpera was voted as a Top Surgeon by the Consumers Research Councils Guide to America's Top Surgeons for two consecutive years, 2011 and 2012. Additionally, Dr. Purpera has held the Top Bedside Manner award given by Virginia's Our Health Magazine three years straight, 2013, 2014 and 2015. Award winning Phlebology and Vascular Surgery services.